When I think of Versace, I automatically think of opulence. The gold emblem, rich, deep reds, dramatic jewels, impeccable tailoring, and Italian dudes pretty much make Versace the iconic maison that it is. But even the largest of superstars started from humble beginnings, and Versace's Ornamental Collection is honoring Milan, the city in which it was founded in. 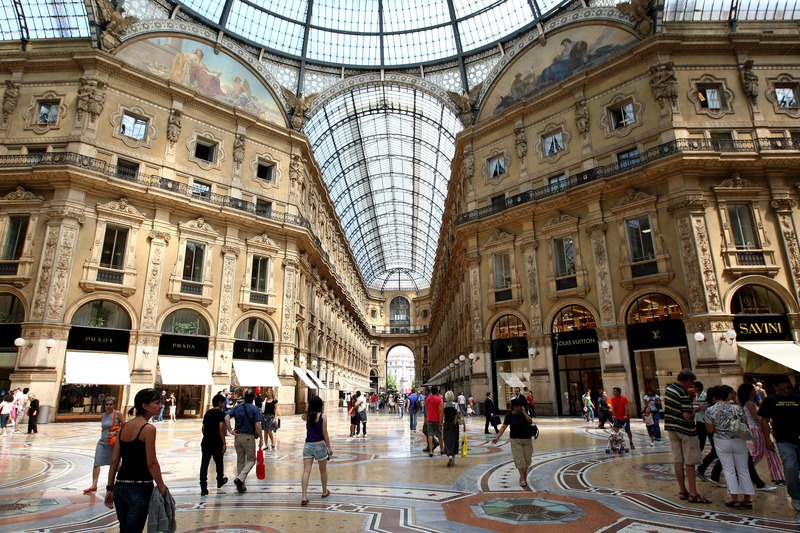 According to WWD, the new capsule collection is shoppable starting on Friday through Versace's websites and at their boutique at the Galleria Vittorio Emanuelle II. Versace sneakers, textiles, and Palazzo bags will be available for sale in the grand dome with a glass ceiling that will be tinted red for the occasion. Items will feature a print that contains images of "domes and cupolas of the Galleria Vittoria Emanuelle II, according to Cover Magazine . The luxury merchandise will of course feature the well-known baroque print in gold and cream. A personal favorite of mine is the Palazzo bag, which looks even more glamorous and unique with the bright primary colors and gorgeous pattern. And the sneakers? Let's just say I wouldn't wear them to work out.